Here is this week's final installment of Tasty Tool Time. If you missed the earlier tutorials click here for the actual instructions. The process is the same for covering the base, the only difference is the top of this ice cream container is big and fluffy. This is a mini...soooo cute and only $1.00 (I know if we figure that price out by weight or ounces, it's probably $500.00 for 2 quarts, but cute wins.) 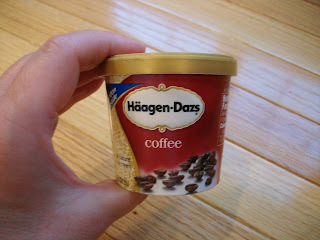 Not to mention...it has a spoon on the inside of the lid, so you can eat this on the run!! 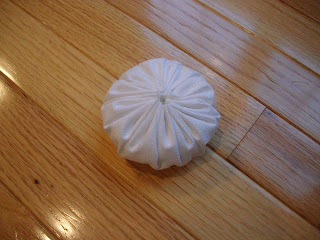 I needed a circle of fabric for the top of the lid. Guess what I used for a template??? 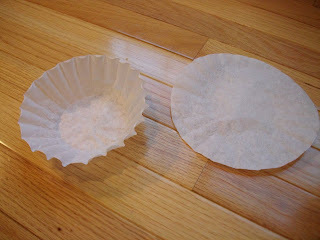 A coffee filter...I have a boat load remember. This is the 4 cup size filter. The one on the right is ironed out. 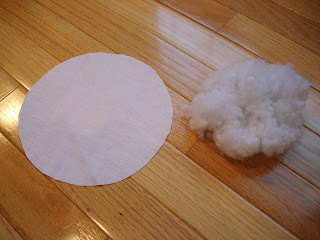 Here is the white piece of fabric I cut out and a little bit of stuffing. This is the first time I've used this stuffing. I LOVE IT!!! I bought this bag new at a consignment shop for $3.00, so I don't actually know how much it costs in the store. 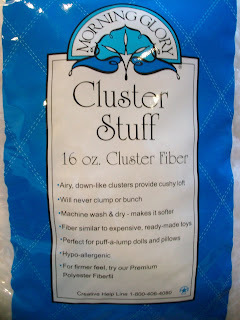 It is little soft pellets of fluff, very soft and doesn't bunch or clump. It feels like down. I think if you click on the picture, you can read the label. In this step, you just hand sew a quick gathering stitch about 1/4" for the edge. Gather it up a little, feel with desired amount of stuffing, pull tight and knot to tie it off. Here's the bottom. 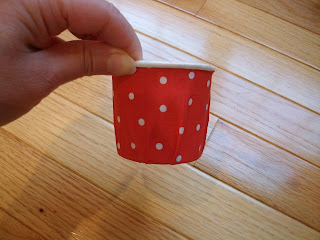 Glue your fabric to the bottom cup, just like the other larger version. I used spray glue here too. 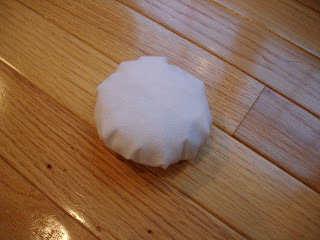 Hot glue your little white puff to the top, add some ric rac or ribbon and I glued a red button on for a cherry. The rim of this cover was a gold color. Next time I might use a 1/4" ribbon instead of ric rac, so the gold doesn't show, but the ric rac is just so darn cute. From here on is where you can use your imagination. 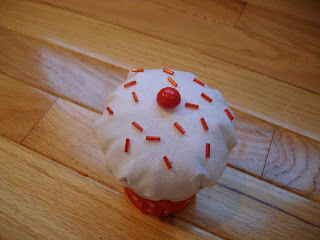 I glued on red beads to look like jimmies or do you call them sprinkles. Then I glued on teal ones for an extra color. You can keep going and going...so fun to decorate. pin box (holds pins on the inside and pin cushion on the top. 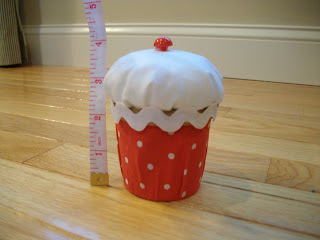 party favor boxes for your little girl's birthday. Hope you liked this tutorial too. I enjoyed this Tool Time a lot for obvious reasons (yummy)!! For next Tuesday, you'd better start eating plenty of canned goods or perking your coffee at home...and save the coffee cans. Remember if you have made anything from my tutorials, I would love to show everyone your creation. I started doing it a while back on "Friends on Friday". I have 2 for today which I will post right after this. Karen...I love the 3rd tutorial. 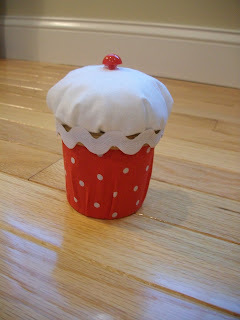 These are just the cutest containers! You are brilliant! 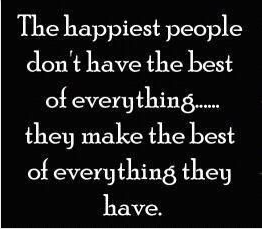 Have an awesome weekend! SO cute...thanks for the tutorials this week! This is just too cute! Very creative. Love the polka dot fabric. It really gives it charm. You have the best tutorials! 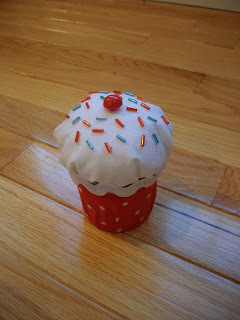 That is one cute cupcake. How adorable. Very clever indeed. I am gonna share this with my readers. So sweet! 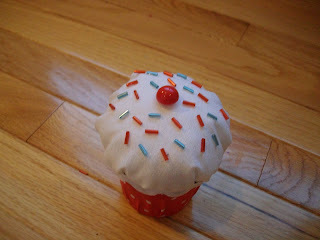 Love your cupcake and the beaded sprinkles are just adorable.